According to director Chantal Akerman, she never planned to make a film in Israel. She was convinced that neutrality does not exist and that her subjectivity would get in her way. She was sure she would only be able to reflect on 'the Israel question' while she was outside the country. It was only when she taught at the University of Tel Aviv, picked up a camera and 'found' suitable images that she decided to make a film. 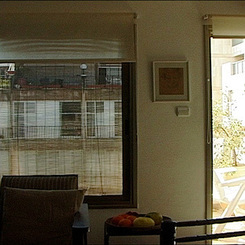 Akerman spends a brief period on her own in an apartment by the sea in Tel Aviv. She takes the chamber play to its ultimate form: it is almost entirely chamber. She films from the apartment and in her narration she talks about her family, her Jewish identity and her childhood. She wonders whether normal everyday life is possible in this place and whether filming is a realistic option. Akerman does not film here with any intentions defined in advance. She wants to be as open and blank as possible to ensure that things take their own course.